The Aspen Choral Society (ACS) began in 1977 when an aspiring young conductor and former Aspen Music Festival Conductor Fellow, Ray Vincent Adams, with the Crystal River Orchestra, and a small group of valley locals presented performances of Handel’s Messiah. As interest in choral singing increased valley-wide, the ACS incorporated as a non-profit corporation in 1995. 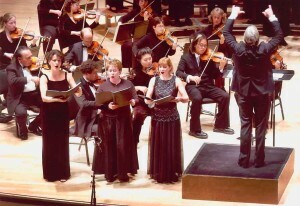 The ACS added performances of choral master works and made its Harris Hall debut in 1999 with performances of the Mozart Requiem. 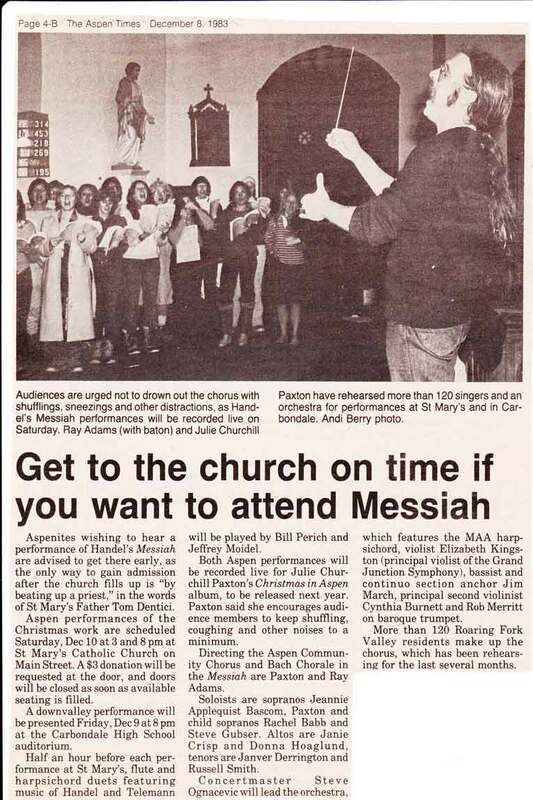 In 2000 the ACS expanded the choir to include the Glenwood Springs Community Chorus with rehearsals and performances of the Messiah in Glenwood Springs as well as Aspen. These performances are very popular, and are often to standing-room only audiences. The ACS, which includes the Aspen Community Chorus, the Glenwood Springs Community Chorus, the Aspen Women’s Chorus and the Glenwood Springs Women’s Chorus has performed the Mozart Requiem and Grand Mass in C Minor, Vivaldi’s Gloria, the Brahms German Requiem, Haydn’s Nelson Mass, and Bach’s Cantata #80 Ein Feste Burg ist unser Gott. Additionally, the ACS has proudly performed world premiere performances of a five-movement sacred suite by Ray Vincent Adams between 2000 and 2006. This suite was commissioned by the ACS along with friends and community members of Aspen, Colorado. It includes Angels, Revelation, Requiem, Passion (dedicated to the memory of Father Theophane Boyd) and Creation. The ACS has also featured talented soloists from its orchestra in Mozart’s Violin Concertos #3, #5, and Sinfonia Concertante, the Strauss Horn Concerto #1 and Bach’s Concerto for Two Violins. The spring 2007 concert included two orchestral pieces: Bach’s Brandenburg Concerto #3 and Orchestral Suite #3. 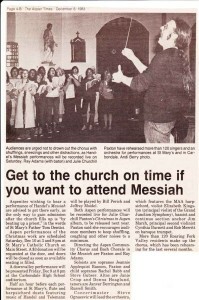 The 2007 season concluded with celebratory 30th anniversary performances of Handel’s Messiah in Glenwood Springs and at the Wheeler Opera House with a choir of more than 150 singers. 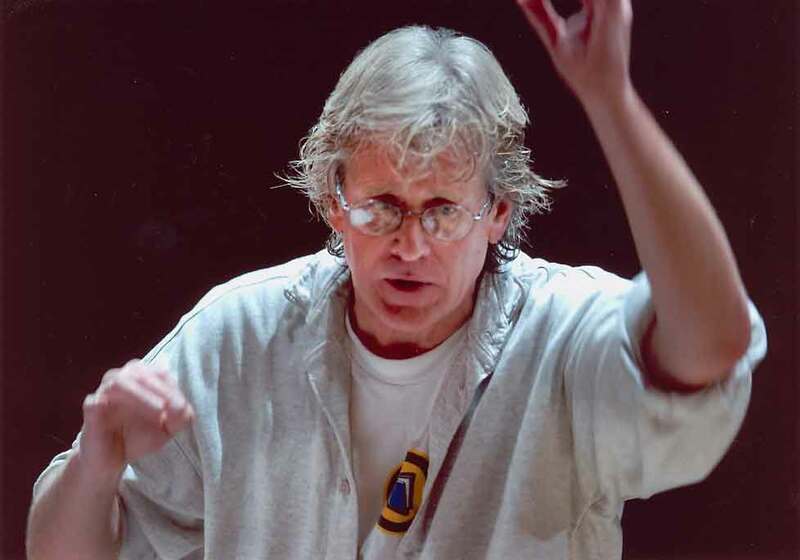 In March 2013, our beloved founder and composer-in-residence Ray Vincent Adams passed away after a short illness. Though he will be greatly missed, his legacy of sharing the joy of music will continue to grace our community. Paul Dankers has directed the Choral Society since 2013, continuing the tradition of the annual Messiah performances as well as sharing new repertoire for the ACS Spring Concerts every year.